I’d like you to take some time this week and look around you. Everything you see, even when you look in the mirror, everything is temporary. Nothing we see will last forever. Everything will change, at some point, for eternity. There is only one thing in the universe that never changes, only one thing that remains the same. Only one thing is eternal. And that is Love. For God is love (I John 4:8). Thus the question must be asked. What is it that really matters? What does it all boil down to? We will not take anything with us into eternity but our hearts. (I’m not talking about the organ in your chest, but something much more interior, see the above verse.) Thus it is only matters of the heart that will endure. And only one thing in existence changes hearts, awakens dead hearts, stimulates the heart, bringing the heart of an individual to life and keeping it alive throughout eternity . . . “with the heart man believes” (Romans 10:10). And “belief is awakened by love” (Galatians 5:6). It’s that simple. Paramount to all else is a heart-level encounter with the truth about God’s love for each of us, an encounter so clear and powerful that it awakens our hearts, changes our self-centered orientation to other-centered love, restoring our hearts into the image of our Heavenly Papa once again, and bidding our newly restored and renewed heart, to live . . . and live forever in an intimacy with the great Lover of the Universe for Whom each of us was made—an intimacy that no words can describe, that can only be experienced. The fruit of such an encounter is that we truly begin to love, not just this incredible God, but all with whom we come in contact, indiscriminately. We take no thought of the state in which we encounter them; we simply begin to love as we have been loved. This is eternity. Eternity really isn’t about self-preservation. It’s not about the quantity of life as much as it is about the quality. The only thing eternal is love. And thus Eternity is rooted and grounded in a living, breathing, dynamic encounter and experience with the greatest Love that has ever been. This is why Calvary is so central and will become even more so as we get closer to when this age ends and the next begins. For Calvary is the clearest, most powerful encounter with the Love that flows from the heart of the God of worlds fallen and unfallen alike, and that ushers us back into the love for which we were made. So, in short, take some time with His love for you this week. Take some time to ponder this. To meditate on what is truly in God’s heart for you, how He thinks and feels for you. For in these themes, eternity begins . . . today. “I pray that you, being rooted and established in love . . . ” — Ephesians 3:17I don’t plan to write a lot this week. A friend of mine that I’ve known since high school sent me three quotations on Facebook the other day, and I want simply to pass them on to you. They truly are quite profound. Each is taken from the book Thoughts from the Mount of Blessing. It would seem that our salvation, our security, our growth in Christ—everything is rooted and grounded, dependent simply on knowing and believing in the love God has for us. Not just knowing that He loves us, but coming to a knowledge of, an encounter with, and a belief in the kind of love, the nature of the love He has for each of us. Do you know the love with which He loves you? Better yet, do you have the courage to believe it? These quite possibly are the most important questions we could answer. For it seems that everything depends on them. May knowing and believing His love become paramount in your life this week. If you love those who love you, what credit is that to you? For even sinners love those who love them. 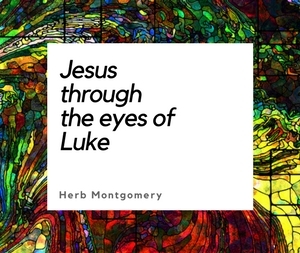 — Luke 6.32I am continually asked, “Herb, how do we reach our post-modern, North American culture with this message of God’s love that you preach?” I often wince inside when I hear this. Most of the time people are expecting to hear about some new method or technique, but in truth, life is simpler than that. Jesus gives us the secret in the above verse to reach others for all time and in any culture: “Sinners love those who love them.” Could it really be that simple? It actually is. How do we love those with whom we come in contact every day? Those we work with, play with, encounter in our recreation and daily activities? I have come up with only one answer to that. First, in all honesty, we can’t. All we can do is come to grips with our own identity as one who is passionately loved by God Himself. Only when this happens will love spring forth from us spontaneously to those we meet. This is the promise Jesus made to the woman at the well. If she could just taste the living water of God’s unconditional love for her, then that love itself would become a well-spring of living water (unconditional love) springing up and overflowing to all those around her. John said it, too. We love because He first loved us. — I John 4:19. All God ever asks us to do is love. But truly, all we can do is believe how much we are loved, and then simply let His love spread out to the world around us. How will people respond? Why don’t we just try it and see? I close this week once again with the words of the apostles Paul and Peter. And when they had nothing to pay, he frankly forgave them both. Tell me therefore, which of them will love him most? (Luke 7.42)This week I thought I would share an excerpt from my upcoming book Finding the Father, to be released this December. Enjoy! The nature of a violation is that one party inflicts loss on an unwilling recipient. For example, we have a violator (for the sake of illustration we’ll call her Nancy) and a violated (we’ll call him Ted). Ted has two options. Ted’s first option is to appeal to a higher power, such as civil government, and ask them to inflict a reasonable level of loss on Nancy in order to restore fairness. This would not necessarily be revenge, but restitution. Nancy (the violator) would be prosecuted. In his second option, Ted could rise above the loss and willingly choose to bear the loss that Nancy inflicted. Nancy would thus be let off the hook and forgiven. In either option, justice must be maintained. In the first option, if Ted called for Nancy to be punished but instead someone else was punished for the crime, this would be unjust. If someone other than Nancy is punished, then balance, equality, and fairness are not achieved. Many times, Christians have given the impression that God (the violated) demanded that we (the violators) be punished, yet, because He loved us so much, He sent His only Son to be punished in our place. If this were true, it would be problematic on many levels, and would be unjust, to say the least, according to the principle that “he who does the crime does the time.” In the second option, if, against Ted’s will, someone other than Ted let Nancy go free, this, too, would be unjust. So, we meet with a challenge. The solution must be just and merciful and we must resist injustice. In the case of the Christian gospel, the result of the sacrifice of Jesus is that the violators (us) go free. How is this not injustice? In our illustration, if Nancy is let off the hook it comes at a price to Ted. Because it comes at a price for him, Ted must voluntarily choose to bear the loss inflicted by Nancy and to relinquish his right of restitution. There is no such thing as forgiveness that doesn’t cost the forgiver something. Now, notice that God’s decision to let us, the violators, go free was not made by someone else against His will. God, Himself, embraced the loss and chose to bear our sins against Him. In a word, this is forgiveness. Calvary is as if God is saying to the world, with open arms (literally), charges have been dropped. This begs the question, was our debt to God repaid or forgiven? Our sins are either repaid or forgiven, they cannot be both. And yet scripture uses the language of both. How are we to make sense of this? We must abandon a model of three-party substitutionary atonement and begin to understand the nature of forgiveness, which is two-party substitutionary atonement. God forgave our sins against Him! Someone else did not repay Him the debt. Yet remember, there is no such thing as forgiveness that doesn’t cost the forgiver something. It cost God something to forgive us. The cost of forgiving is a payment not received but made by the one doing the forgiving. This is why we see God on the cross, and not us! God, the violated party, recognized the injustice done, realized His cost to forgive, and willingly bore that cost out of love so that you and I, the violators, could go free. But what about justice? We must include justice for the picture to be complete. In the scenario with my Muslim friend, if he should rise above the infliction of those who stole money from him, one person would still suffer. Who? Him, the violated. Yet something would have changed. Instead of someone else letting them off the hook and dropping the charges, my friend himself would voluntarily and willingly drop them. No third party would innocently step in and substitute for the guilty ones, nor would someone else let them off the hook unjustly. Rather, the violated party himself would choose to bear the loss and to put himself in the place of the violators. Justice cannot say a word against this. It is the right of the violated to drop charges if they so choose. No one else can justly let the violators off the hook, only the violated, and only voluntarily, for it will cost him everything. This is still an act of substitution, a type of substitution that is acceptable and justâ€”it is forgiveness. The violated willingly and voluntarily puts himself in the place of all the violators, willingly bears what was done against him, in order for the violators to go free. This is exactly how Jesus sought to explain the act of Calvary. Be watching for the release of Finding the Father at www.renewedheartministries.com this December. But, I want you to stop for a minute and take the following list of descriptions of love (taken from 1 Corinthians 13). Meditate on each sentence. Contrast it with your personal picture of what type of a person God is, along with how Jesus revealed the Father to be. And then, take the time to write down your thoughts, your questions, what this exercise reveals about your picture of the type of being God really is. It’s a simple exercise, but some pretty phenomenal heart-level discoveries can come as a result. (The first few are easy, but, as the list goes on, it becomes pretty challenging.) Enjoy! Love does not keep records of wrongs suffered. May God do rich things in your heart this week. I wish you His best.